* If you any ideas about how I can make this site better serve you, please let me know. * If you know of any great vinegars not talked about on this site, contact me. * If you know of any unique ways to use vinegar that are not already on the site, email me. 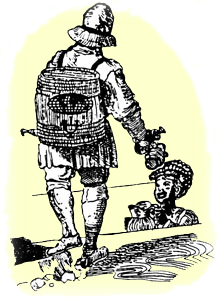 * Become a Vinegar Connoisseurs International FaceBook fan and join in discussions there about vinegar. The goal of this site is to be as user friendly as possible. If there are things that are confusing or just don't work, let me know. This site is designed around a "point and click" concept so, when in doubt, click on something, especially text that is underlined or a different color that the surrounding text. There are lots of links, so if something doesn't work let me know. Whenever you see the V Man Tip logo, click on it for some helpful tips, advice and comments from The Vinegar Man. Clicking on the same thing again will close the comment or reverse the effect it caused. If you somehow get lost on the site, check the "bread crumb" at on the page or just return to the home page and start over. Most of the information the site has to offer can be located from the content page. I have tried to organize the information and cross reference it to make things easy and fun to find. Only your feedback will let me know to what extent I have succeeded and what I need to change. If you already have a pretty clear idea of what you are looking for, use the search function to find it. The Vinegar Mart is the place where you can find vinegar items for sale. I have tried to locate the items from reputable dealers. If you have any problems with any of the vendors, please let me know. I don't run their businesses, but I don't want to send my vinegar fans to businesses that don't take care of them. Please mention you learned about them from this site. It gives me more clout, if I have to go to bat for you. If you have questions about vinegar that are not answered on this website, I can't imagine what that might be :-), please email me. The contents on this site are divided into these major areas. I appreciate any contact I have with my vinegar fans around the world. Click to find out how to contact me. I am also known as Lawrence Diggs. If you are on the internet, you can do a search to find out many things about me, some true, some dubious. To find out what I have been up to and what I am currently up to, please go to my portal site, www.LDiggs.com. Click here to find out about my vinegar activities. There are many kinds of vinegar in the market place. There are many products that will help you to make and use vinegar. And there are many books, including my own, that will help you to make, use and enjoy vinegar. The Vinegar Mart is the place where you can find vinegar items such as these for sale. I have tried to locate the items from dealers that give good service. If you have any problems with any of the vendors, please let me know. I don't control their businesses, but I don't want to send my vinegar fans to businesses that don't give good service. Please mention you learned about them from this site. It gives me more clout, if I have to go to bat for you. Let me know if you find a product or a vinegar vendor you think should be here. The International Vinegar Museum opened in 1999 in Roslyn South Dakota. I started it as a small business marketing demonstration project. I wanted to show that a small town of 250 people, that few people had ever heard of, on a small road, in a very rural place, could do something that people around the world would notice. Once the museum appeared in prestigious news media around the world, started drawing visitors and receiving orders for vinegar from around the world, was placed on major maps and tour busses full of people started showing up, I figured my point was made and my job done. I have turned the museum over to the community that made it happen. They are now expanding it far beyond any plans I had. I am still a supporter and very much connected with it, however I have now turned my attention to new projects. If you haven't visited The International Vinegar Museum, don't die before you do. You will have missed one of the major opportunities life offers! I hope to create a vinegar community on this website. Please join our Facebook Community and become a fan. That way you can share your ideas with other vinegar fans and learn from them as well. I have many fans and contacts in the Wonderful World of Vinegar. I have placed links to many of their websites and YouTube videos. Check them out. If you are a vinegar fan and want a link drop me an email. Please tell your friends about this site. One quick and easy way to do it is to email link to this site or particular page. As you will see I have tried to join forces with as many people as possible to make this site work for you. Especially for references. You will find lots of links to Wikipedia. I have tried to use direct meanings dictionaries rather than make up my own meanings to words. When I have meanings that are significantly different, I will point it out and or add to the Vinegar Dictionary.